This instalment is a little breather between the fairly heavy instalments on searching, and the upcoming set of instalments on networking. We’ll start with a look at some tips and tricks for getting the most out of BASH, and then transition to some tips and tricks for getting the most out of the OS X Terminal app. You’ll see that when you issue !! as a command the first thing it does is print out what it is that is being executed, then it does it. The !! command lets you go back just a single command, you can go back further using the up arrow key (and the down arrow key if you go past the command you wanted by mistake). Ubuntu does this by default, and I find it a much nicer way of working, so much so that I add the above command to my ~/.bash_profile on all my Macs. As you type, what you enter will appear before the :, and the most recent matching command will appear after the :. To accept a match just hit enter and you’ll return to the regular prompt with that command entered and your cursor positioned at the end of the command. To search for older matches to the same search string hit ctrl+r again, and if you go past the one you wanted, hit ctrl+shift+r to go the other way. This all sounds more complicated than it is, and with a little practice you’ll soon get the hang of it. You can move the cursor within a command with the left and right arrow keys, but if you use the up and down arrows or ctrl+r to search the history your cursor will always be placed at the end of the command, and you will often need to edit the start of the command. You can just use the left arrow key until you get there, but with long commands this can be a real pain. ctrl+a will jump the cursor to the start of the command. If you drop a file or folder onto the Terminal its path will be typed into the Terminal. 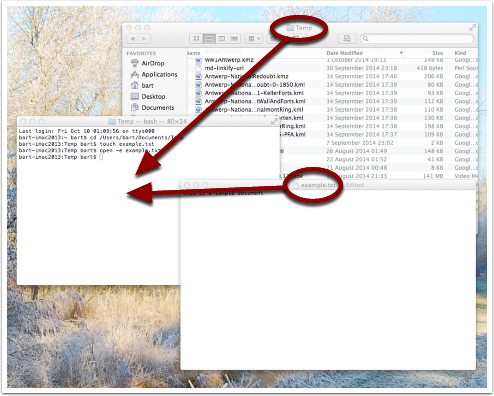 This includes proxy icons at the top of document windows, the folder proxy icons at the top of Finder windows, and the folder proxy icon at the top of other Terminal windows. Note that this will not work for hidden files. Hopefully you’ll find at least some of these tips and trips useful, and find yourself being a little more efficient on the command line. In the next instalment we’ll make a start on what will be a quite long series on networking. We’ll start by laying a theoretical foundation, and then get stuck in with a selection of network-related terminal commands.